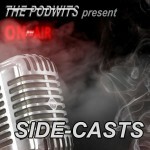 J. Blake and Dion Baia are back for another exciting installment of the Podwits Side Cast! This week the boys have picked 10 live albums that they feel are great and *must* listens for anyone unfamiliar with them. The boys have managed to narrow it down to 5 each, and try to surprise each other as to what is on each list and why they think each album has a place on said lists. So come on down and see which picks the boys decided on and see if you know them all, on this week’s edition of the Podwits Side Cast.